Hazard: The filler cap at the top of the unit can crack and allow steam to escape, posing a risk of burns to the user. In addition, the cap can pop off unexpectedly as a result of pressure buildup, posing an impact injury risk to a bystander. 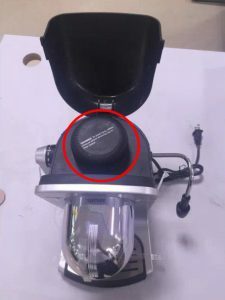 Consumers should immediately stop using the recalled espresso makers and contact IMUSA for a free replacement filler cap. 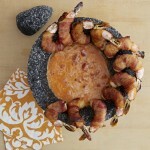 Consumer Contact: IMUSA toll-free at 844-750-4165 from 8:30 a.m. to 5 p.m. PT Monday through Friday, email at recall@bowlesverna.com or online at www.imusausa.com and click on “Recall” at the top of the page for more information. 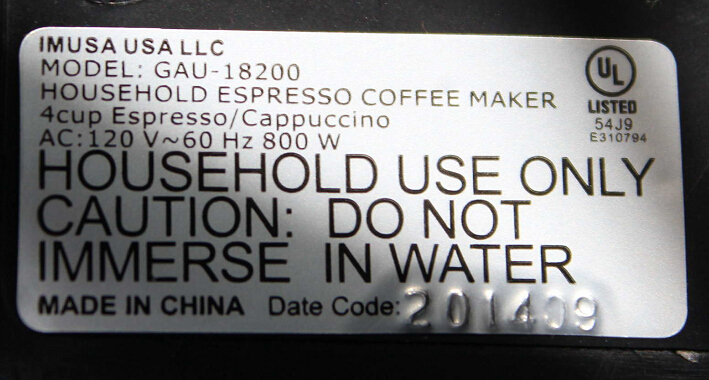 Description: This recall involves IMUSA espresso makers. The black or gray and black espresso makers have model numbers GAU-18200 and GAU-18201. 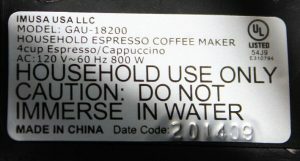 The caps on the recalled espresso makers have date codes “201407” to” 201411″ The model number and date code are printed on a rating label on the bottom of the espresso maker. 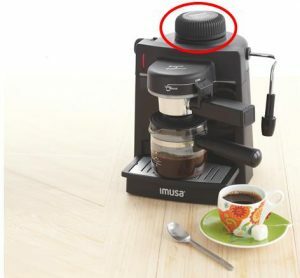 “IMUSA” is printed on the on front of the espresso maker. Incidents/Injuries: The firm has received 43 incidents including one report of a consumer who sustained burns to his hand from steam escaping through a crack in the cap. Sold at: Kmart, Sears, Target and other stores nationwide from July 2014 through November 2014 for between $30 and $45. Importer: IMUSA USA, LLC, of Doral, Fla. 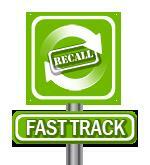 This recall was conducted, voluntarily by the company, under CPSCs Fast Track Recall process. Fast Track recalls are initiated by firms, who commit to work with CPSC to quickly announce the recall and remedy to protect consumers. 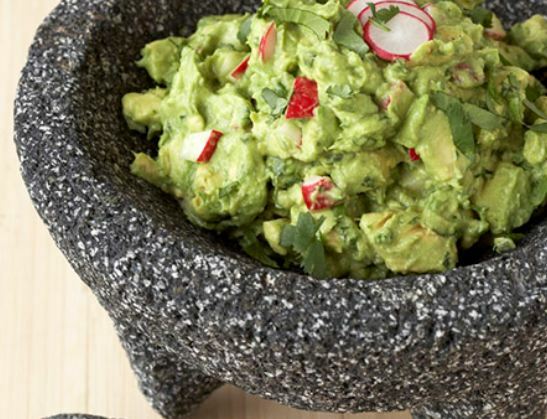 The U.S. Consumer Product Safety Commission is charged with protecting the public from unreasonable risks of injury or death associated with the use of thousands of types of consumer products under the agencys jurisdiction. 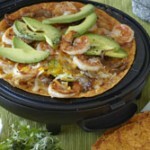 Deaths, injuries, and property damage from consumer product incidents cost the nation more than $1 trillion annually. CPSC is committed to protecting consumers and families from products that pose a fire, electrical, chemical or mechanical hazard. CPSCs work to ensure the safety of consumer products – such as toys, cribs, power tools, cigarette lighters and household chemicals contributed to a decline in the rate of deaths and injuries associated with consumer products over the past 40 years. To report a dangerous product or a product-related injury go online to www.SaferProducts.gov or call CPSCs Hotline at 800-638-2772 or teletypewriter at 301-595-7054 for the hearing impaired. Consumers can obtain news release and recall information at www.cpsc.gov, on Twitter @USCPSC or by subscribing to CPSCs free e-mail newsletters.